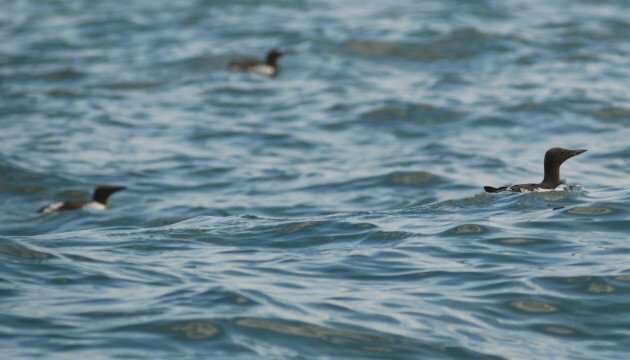 Across the world’s northern oceans, 24 species of auklets, murres, puffins, guillemots, and related seabirds make a living catching food beneath the waves and breeding, often in large colonies, on coastlines and islands. Together, these birds compose the family Alcidae, and they share adaptations that we recognize as penguin-like: an upright stance on land, black-and-white plumage, and — most important — wings that propel them underwater in pursuit of prey (see them in action here). Unlike the southern hemisphere’s penguins, however, alcids can also use those flipper wings to fly. The birds above are Common Murres, large and widespread members of the family, that I photographed last year off the Oregon coast. Alcids sport a variety of head plumes, bill ornaments, crests, and other colorful characteristics. They nest along coasts, some in large colonies on bare, rocky cliffs; some in burrows in the ground; and one, the Marbled Murrelet, high in old-growth trees. Alcids form a distinctive family within the shorebird order Charadriiformes. Several recent genetic analyses indicate that alcids are most closely related to the highly aerial predatory and kleptoparasitic skuas (Stercorariidae) and that these two families are in turn sister to the gulls, terns, and skimmers. Alcids are thought to have originated along the coasts of the Pacific Ocean during the Eocene or even the Paleocene. They gradually spread to the Atlantic Ocean by way of the southern coast of North America (before it was joined to South America) and gained the ability to pursue prey by diving in cool waters (see Pereira and Baker 2008). All alcid species alive today can fly, but with difficulty. A study last year demonstrated that the largest living alcid, the Thick-billed Murre, faces extraordinarily high energy demands in flight and is also a less efficient diver than penguins are — in other words, while it can both fly and dive, it pushes the limits of both abilities, but especially flight. The authors wrote, “optimizing wing shape and form for wing-propelled diving leads to such high flight costs that flying ceases to be an option in larger wing-propelled diving seabirds, including penguins,” and the recently extinct flightless Great Auk (Elliott et al. 2013). Much longer ago, other alcids also gave up flight; several species and genera are known from the fossil record. While some of their cousins, especially skuas and terns, sought their fates in the skies and became some of our planets greatest aerial wanderers, alcids took a different path, exploiting the abundant food resources teeming in the planet’s cold northern waters, filling a niche similar to the one penguins adapted to fill in the southern seas. They’re tenacious, finely tuned survivors, and they look good making it happen, too. They really are special birds. I’ve been lucky enough to watch at breeding colonies in Iceland and Svalbard and it was a really wonderful experience. Thanks for a great post! I liked the video, too. Alcids are the most interesting birds we have here on the Olympic Peninsula. I love these birds, but honestly, one question. Why use alcid when there is a perfectly acceptable word, auk, available? Good question, Duncan — it certainly seems to be one of those things that is fairly entrenched on either side of the Atlantic. That’s been my experience, at least, and a quick web search seems to reinforce. I think we can blame Roger Tory Peterson: he uses the word in a couple of the species accounts in the 1934 guide, and “‘Alcids'” (in single quotation marks) is the very first word in the family introduction in the definitive edition of 1947. I can’t think offhand of any popular work that used anything but “auks” before that. 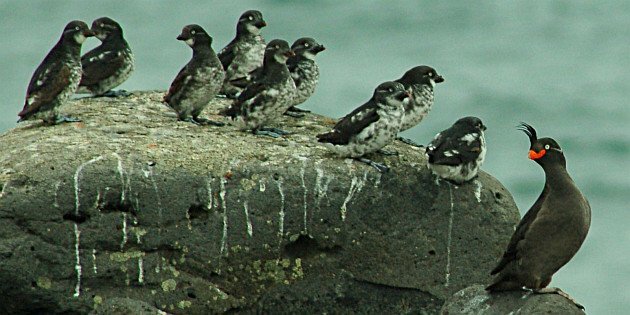 As to the reason that we in North America prefer “alcids” to “auks,” I assume that it is because there are so many different English names applied to the species in this family — and that the only one for which we use “auk” happens to be extinct. It’s different for the British, of course, with their little auks. Great blog entry, David; thanks. Very interesting — thanks, Rick. RTP’s influence is remarkable. Weird. I have no recollection of alcid being used in California where we studied five different species.